An integrated refrigerator is a trend in a high-end kitchen appliance. They provide a large amount of storage to store food or other things. We can now plan our kitchen storage in such a way that our food and drinks can be conveniently segregated. Integrated refrigerator offers the industry’s most-advanced food-preservation features and designs. Useful for everyday use, we can integrate this fully integrated refrigerator into our kitchen. It includes the most-advanced food-preservation features and widest range of models of any brand. It is 762 mm wide and provides a combined 397 litre capacity of refrigerator storage in the upper cabinet and two spacious, flexible drawers below. A new internal water dispenser delivers the chilled, filtered water without disrupting the clean look of the refrigerator's exterior. It stands 214mm tall and includes a host of features designed to extend the life of fresh food, including air purification and a patented door-seal system that effectively locks in cold air. High-humidity, lower-temperature also provides the perfect conditions for storing fresh food produce. The updated interior takes on a crystal-like appearance with minimal use of plastic trim and the addition of bright, soft-on LED lighting. As a fully integrated refrigerator, it comes ready to be fitted with custom panels. 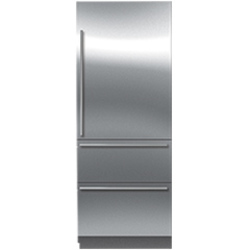 Also, high-quality stainless steel panels and handles are available as sales accessories.